MRI images are commonly viewed in three planes: axial, coronal, and sagittal. The most commonly used techniques for MRI imaging are T1-weighted, T2-weighted, Flair and Diffusion-weighted. Or it may enhance only around the edges, making it “ring enhancing” as in a brain abscess, or in this lung met. 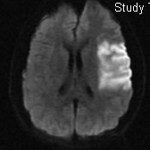 T2 weighted images are great to evaluate CSF spaces, which appear bright white. Brain appears light gray. Use the T2 sequence to check the size and symmetry of the ventricles, and look for bright signal of edema surrounding an aggressive tumor or a subacute stroke or hemorrhage. Also check the T2 images for Multiple Sclerosis, with its characteristic periventricular white matter changes–bright splotches around the lateral ventricles. The bright signal is the scarring of the myelin sheath in the white matter–the “sclerosis” shows up on T2 images. The flair sequence is “a T2 with dark CSF,” very sensitive to edema and to parenchymal abnormalities like a low grade glioma. In fact a grade 1 astrocytoma will be virtually invisible on T1, but will be unmistakable on Flair. The flair sequence is useful for surveillance of a low grade glioma, as you watch for signs of enlargement like fattening of the gyri. Diffusion weighted images have one purpose: to visualize an area of acute ischemia. Say a person has new onset of stroke symptoms. A CT shows no blood, proving that the stroke is not hemorrhagic. 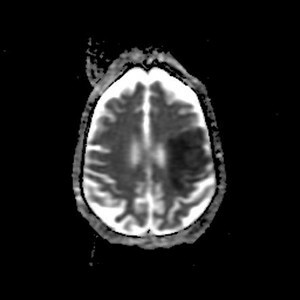 An MRI will show the stroke as bright signal on the Diffusion-weighted images, and dark on the diffusion ADC sequence. An MRI is the study of choice for tumor, multiple sclerosis, and ischemic stroke. Add gadolinium contrast to evaluate tumor and abscess. 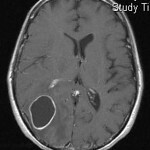 For brain hemorrhage, however, CT is the go-to study. Thanks.Realy I was having a problem in reading brain CT and MRI.Now at least I have a systematic approach. nice and simple presentation for radiologists who don’t have the opportunity of reporting MRI. thanks for your simple approach. VERY VERY SIMPLE N EASY TO LEARN FOR A BEGINNER LIKE ME,,,,, THANK U SOOOO MUCH DOCTOR,,, PLEASE POST MORE…. Thanks for you share the right way. Hope that you will continue. Simple and nice. I like it. I really enjoyed the presentation and the simple approach it took on towards the subject. Thank you so much for your time and effort. What does it means when you MRI says “Areas of Parenchymal Enhancement”? Hi did you ever get a response from this question, I had sort of the same reading on my report. My MRI findings: Cerebral Hemispheres/Basal Ganglia: Subcentimeter serpiginous focus in the lateral left frontal lobe (series 401 and 501, images #23) is either a developmental venous anomaly or prominent perivascular space. No acute infarct. No mass effect. No hemosiderin. Brainstem/Cerebellum: Unremarkable. Ventricles/Sulci: Within normal limits for age. No abnormal extra-axial fluid collection. Basilar Cisterns: Clear. Vasculature: Normal flow voids. Ectatic left vertebral-basilar arteries. Paranasal Sinuses: Clear. Bones/Soft Tissues/Orbits: Unremarkable. IMPRESSION: No acute intracranial process What does this mean? Thank you….. it was really helpful. Thank You~ is really simple to understand. MRI is such a complex topic, I hope there is more to come regarding further understanding on MRI and CT. Simple and systematic brain mri reading approach. Expecting such more presentatins dealing chest, abdomen and spine in near future . Many thanks. I am 30 yr old female that had had a history of hormonal imbalances including hypothyroid to hyperthyroidism, pituitary adenoma, PCOS, and some lipid panel numbers out of range. I had a MRI done to see if I still had the pituitary adenoma and according to the report it was no linger there after. Few years of treatment. However, and incidental finding stated the following. [Incidental note is made of a left anterior frontal poetical modal focus of enhancement in yr brain parenchyma. Common new compared to prior exam dated 2 years back. 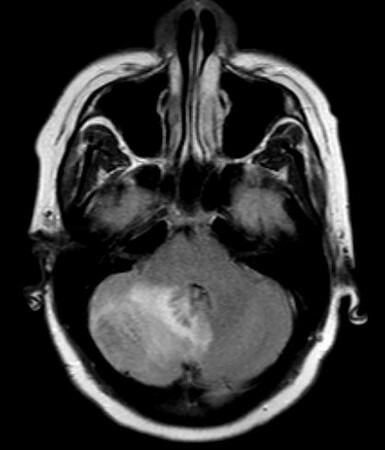 Advise correlation with dedicated MRI of the brain with and without gadolinium. A demyelinating focus must be considered.] So this MRI was done with and without contrast when they found this marking. Went to a Neurologist and he advised it could simply just be a light/glare on the machine while taking images. My endocrinologist didn’t see a need to repeat a MRI since I had met with the Neurologist. I’ve been having some tingling and prickling over both feet, and body now when going outside in heat or taking hot baths. I am afraid that this could be MS fr reading about symptoms. I don’t know if the tingling that has been in my feet off and on for almost 2 years is hormone related/stress/anxiety, or what. Please help! Vision, balance, muscles, are all fine. It’s just the tingling. 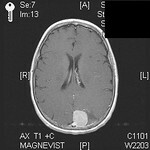 I need help from another medical professional to interpret those incidental findings on the MRI. Hi can someone tell me what “There is a complexity at the basilar tip likely representing a common origin between the posterior cerebral artery and the superior cereberllar artery on the left. No definite aneurysm identified. This medical term is confusing. Thank you for a response. For any patient: if an MRI shows an abnormal blood vessel, the doctor may recommend follow up imaging to get a better look, or a different look. This may be a CT-angiogram, or a femoral-cerebral angiogram. A doctor sometimes will say, “Not sure what this is …. let’s just check it again after a period of time to see if it changes.” Your doctor will recommend a course of action for you. In any case, hope you do well! In my report[There is 12*8 mm ring lesion in the left partial lobe. It is hyperintense on t2 w and flair images with minimal perilesional adema] is there any danger and why this ring formed and which type of madicene used please tell me. Sorry to hear of your trouble! The report may have given some possibilities for diagnosis, and your doctor will make recommendations for treatment. For any patient with a brain lesion: sometimes he or she will need a biopsy of the lesion … or bloodwork to look for systemic disease (like infection) … or just a follow up scan to check its behavior over time. The MRI alone may not provide a definitive diagnosis. Good luck and good health to you! Hi, I am male, age 66, just diagnosed with Mitochondrial Myopathy. Pursuant to an order by my Neurologist I had an MRI of the brain “without intravenous contrast using routine protocols. 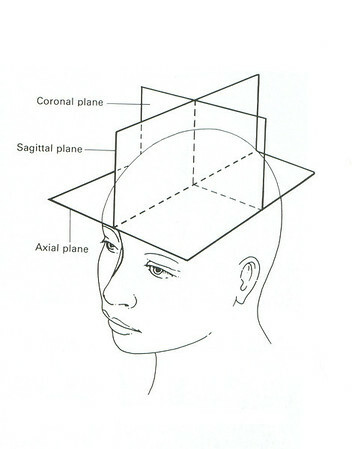 Multiple sequences were obtained in the axial, sagittal and coronal planes”. At the time of the Brain MRI, my Neurologist suspected that I had some form of Myopathy due to certain elevated markers, including CK, IgA, Adolase, Folate and CRP. Other procedures performed prior to MRI include, EMG of left thigh, EEG, (without contrast) awake and asleep, Doppler of the Carotid Artery. I presented with a variety of symptoms which appeared, at the time to be unrelated. My Neurologist approved an Open MRI. Since I had the MRI I have been diagnosed with Mitochondrial Myopathy (G73.1) by my Neurologist. I just learned that the T rating of the MRI Machine for my Brain MRI is .035T. My question is, are the images captured by a .035 T Machine adequate to discover and assess any anomalies which might be related to Mitochondrial Myopathy? The radiologist report indicates the MRI did not find any anomalies at all. However, the Radiologist strongly recommends vascular imaging or conventional angiographic imaging. I am trying to understand why the Radiologist,t who did not find any anomalies in the MRI of the Brain,would recommend the aforementioned imaging. Does the Doppler of the Carotid Artery satisfy the recommendations of the Radiologist. I have not had any success getting the Radiologist to return any of my phone calls. Thank you very much for your consideration. Really Excellent And Most Important Information Regarding The MRI Brain With Its Sequences And Comparison Studies..
My mom is 73. She has short term memory loss. She failed her cognitive test, and they did a MRI of her brain. She was told she had a milky colored ring around her brain and it was vascular dementia. She was tested years back and had a 60% blockage. Could that be partly the reason. I do not live near her but my sister goes to her appts with her. Thank you very much. ! It so easy to understand! Can you explain what is shading in MRI ?